"Yi Chang" redirects here. For the Hong Kong actor surnamed Chang, see Chang Yi. Yichang (Chinese: 宜昌; old postal name 'Ichang') is a prefecture-level city located in western Hubei province, China. It is the second largest city in the province after the capital, Wuhan. The Three Gorges Dam is located within its administrative area, in Yiling District. As of the 2010 census, its population was 4,059,686 inhabitants whom 1,350,150 lived in the built-up (or metro) area made of Yiling, Xiling, Wujiagang and Dianjun urban districts as Xiaoting District is not urbanized yet. In ancient times Yichang was known as Yiling. Historical records indicate that in the year 278 BC, during the Warring States period, the Qin general Bai Qi set fire to Yiling. 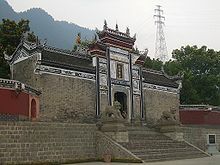 In 222 AD Yichang was also the site of the Battle of Yiling, during the Three Kingdoms Period. Under the Qing Guangxu Emperor, Yichang was opened to foreign commerce as a trading port after the Qing and Great Britain agreed to the Chefoo Convention, which was signed by Sir Thomas Wade and Li Hongzhang in Chefoo on 21 August 1876. The imperial government set up a navigation company there and began building facilities. Since 1949, more than 50 wharves (with a total combined length of over 15 kilometres (9.3 mi)) have been constructed at the port. During the Second Sino-Japanese War, Yichang was a primary supply depot for the defending Chinese army. In October 1938, as the Japanese moved up the Yangtze River towards the strategic city of Chongqing, it became clear that Yichang needed to be evacuated. In 40 days, under the direction of businessman Lu Zuofu, more than 100,000 tons of equipment and 30,000 personnel were transported upstream by steamship or by porters pulling smaller vessels through the Three Gorges rapids to Chongqing. In 1940, the Battle of Zaoyang-Yichang took place in the area. 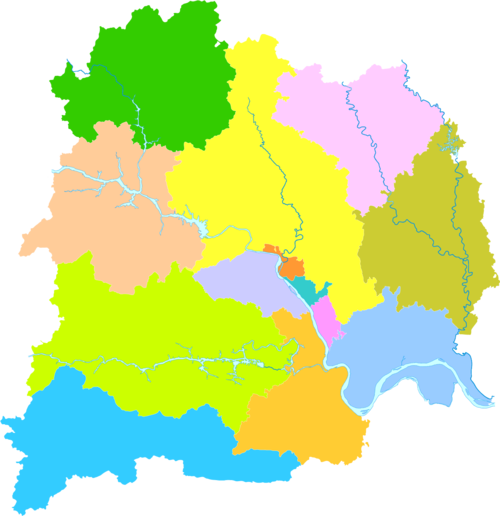 Administratively, it is a prefecture-level city; its municipal government has jurisdiction over five counties, five urban districts, and three satellite county-level cities (Yidu, Dangyang, Zhijiang). 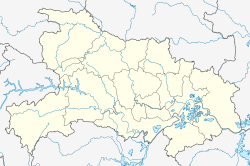 Like most prefecture-level cities, Yichang includes both an urban area (what's labeled on less detailed maps as "Yichang") and the surrounding country area. It covers 21,084 square kilometres (8,141 sq mi) in Western Hubei Province, on both sides of the Yangtze River. The Xiling Gorge (西陵峡), the easternmost of the Three Gorges on the Yangtze, is located within the prefecture-level city. Within the prefecture-level city of Yichang, the Yangtze is joined by a number of tributaries, including the Qing River (right), Xiang Xi and Huangbo Rivers (left). The central urban area of Yichang is split between several districts. On the right (northeastern) bank of the Yangtze are located Xiling District (where the city center is located), Yiling District (neighborhoods north of the center) and Wujiagang District (southern area). The city area on the opposite (southeastern) bank of the river is included into Dianjun District. All these districts, with the exception of the central Xiling, also include a fair amount of suburban/rural area outside of the city urban core. Yichang has a four-season, monsoon-influenced, humid subtropical climate (Köppen Cwa), with cool, damp and generally overcast winters, and hot, humid summers. The monthly 24-hour average temperature ranges from 4.9 °C (40.8 °F) in January to 27.7 °C (81.9 °F) in July, while the annual mean is 16.85 °C (62.3 °F). Close to 70% of the annual precipitation of 1,140 mm (45 in) occurs from May to September. With monthly percent possible sunshine ranging from 24% in January to 49% in August, the city receives 1,568 hours of bright sunshine annually, and summer is the sunniest season. 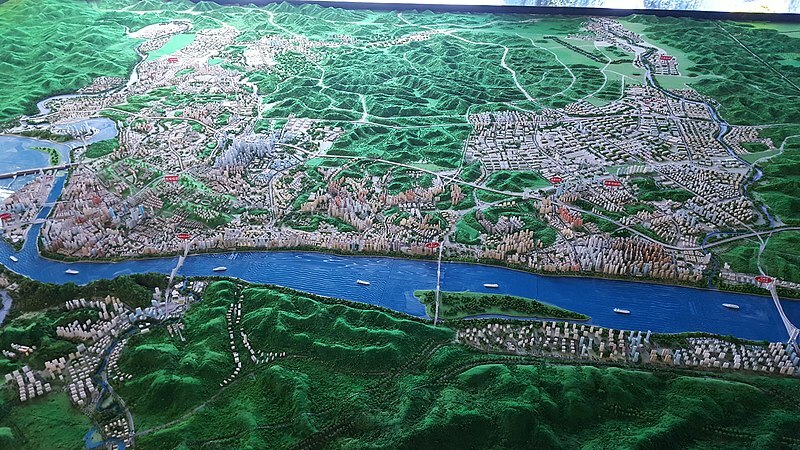 Yichang Sanxia Airport is located in the Xiaoting District of Yichang City, 26 km (16 mi) away from the city center and 55 km (34 mi) from the Three Gorges Dam site. The airport  is conveniently located, which borders Yihuang Highway in the north, Long River Golden Waterway in the south and Jiaozhi Railway in the east. Several provincial highways connect Yichang center city with most counties. Xiling Bridge, connecting Letianxi and Sandouping in Yiling District, a few km downstream from the Three Gorges Dam. Yiling Bridge, downtown Yichang (a few km downstream from the Gezhouba Dam). It connects the urban Xiling and Dianjun Districts. Yiwan Bridge: A Railway Bridge for Yiwan Railway which connects Yichang to Chongqing by high speed trains,almost 5 km (3.1 mi)downstream from the Yiling Bridge. There are several ferry crossings as well. Yichang is an important river port on the Yangtze river. Maoping Town (the county seat of Zigui County), has an active passenger wharf as well. The Qing River in the southern part of the prefecture, with its cascade of dams, is an important waterway as well. Yichang is served by several railway lines. Yichang Railway Station, located in downtown Yichang, opened in 1971, was the city's first railway station. In 2012 it closed for a renovation project. The Yichang East Railway Station, opened in the late 2010 in the eastern suburbs of Yichang, is presently the city's main train station. It is the junction point of two segments of the Shanghai-Wuhan-Chengdu Passenger Dedicated Line, one of China's new east–west rail mainlines. To the east, the Hanyi Railway (opened June 29, 2012) provides frequent service to Wuhan, with some trains continuing to Nanjing and Shanghai. To the west, the Yiwan Railway (Yichang-Wanzhou; opened December 2010) serves as the gateway to Hubei's southwestern panhandle (Enshi), with some service continuing to Chongqing and Chengdu. The Jiaozuo–Liuzhou Railway, a north–south line, crosses the eastern part of the prefecture-level city. It crosses the Yangtze at Zhicheng in Yidu County-level City. Yichang has a population of 4,150,000 with urban population of 1,338,000. Yichang prefecture-level city, is home to many members of the Tujia ethnic group, who mostly live in several counties in the south-west of the prefecture. Yichang also formed the border between the cultures of Ba in the west (an ancient state in the eastern part of what is now Sichuan Province) and the Chu State in the east (an ancient state in what is now Hubei Province and northern Hunan Province). Since 2002, Yichang City has been home of the China Three Gorges University (the result of the merger of the University of Hydraulic & Electric Engineering, Yichang and of Hubei Sanxia University), the largest comprehensive university in Hubei Province outside Wuhan, with over 20,400 full-time students. There are 170 secondary schools in Yichang enrolling 150,700 students. 53,900 of the citizens in Yichang hold a secondary school degree. There are 282 elementary schools being located in Yichang enrolling 156,900. 27,600 of the citizens hold secondary school degrees. 383 kindergartens located in Yichang with 78,500 children. Yichang has long been a major transit port and distribution center of goods, and serves as the economic hub of western Hubei province and an intermediary between the major cities of Chongqing and Wuhan. Its primary industries are shipping and shipbuilding, taking advantage of its location on the Yangtze River. Yichang prefecture is the site of many major hydroelectricity projects. The best known of them are the two huge dams on the Yangtze River: the Gezhouba Dam (located just upstream of Yichang central city) and Three Gorges Dam, which is 40 kilometres (25 mi) upstream. The Geheyan Dam and Gaobazhou Dam on the Qing River are important as well. Besides those, a huge number of medium-sized and small power plants operate on smaller rivers and streams within the prefecture. ^ 抗战中的宜昌大撤退：保留中国抗战工业命脉的壮举. 15 April 2015. ^ 宜昌市2010年第六次全国人口普查主要数据公报 (in Chinese). Yichang Statistics Bureau. May 30, 2011. Retrieved 5 December 2013. ^ 宜昌市土地利用总体规划（2006－2020年） (in Chinese). Yichang Bureau of Land Resources. Nov 18, 2013. Retrieved 5 December 2013. ^ "History of Yichang" (in Chinese). Official website of Yichang Government. 2007-09-19. Archived from the original on 2008-04-21. Retrieved 2008-06-06. Report on the Physical, Commercial, Social and General Conditions of Ichang and Neighborhood. H. A. Little. (Diplo. and Cons. Rpts. [London], Misc. Ser., 1908, No. 671, p. 24).— C. F. Langworthy. 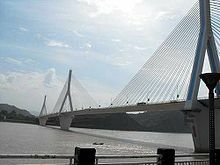 Wikimedia Commons has media related to Yichang. Wikivoyage has a travel guide for Yichang. This page was last edited on 8 February 2019, at 12:01 (UTC).